Back to News Listing To End All Wars and Commander: The Great War 50% Discounted! The failure of the Kaiserschlacht made the Allies ready to re-take the initiative, commencing the Hundred Days Offensive, which put an end to the War. 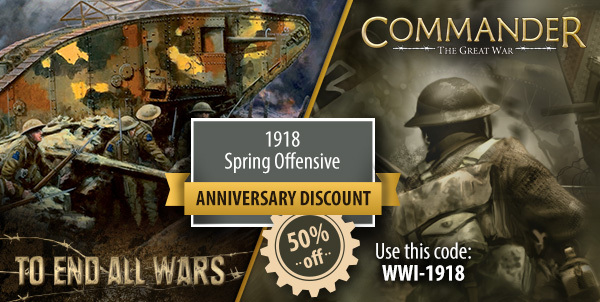 To better celebrate this important recurrence, we are offering a 50% discount for To End all Wars and Commander the Great War for the entire day! Use the code WWI-1918 to apply the discount on your purchase! The discount is valid also for boxed editions! Do you want to see some action? 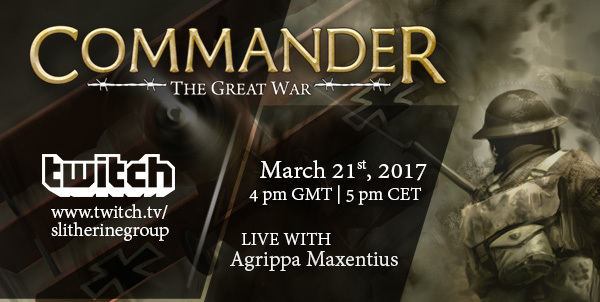 Follow us on our Twitch Channel as we stream Commander the Great War at 4 GMT – 5 CET!